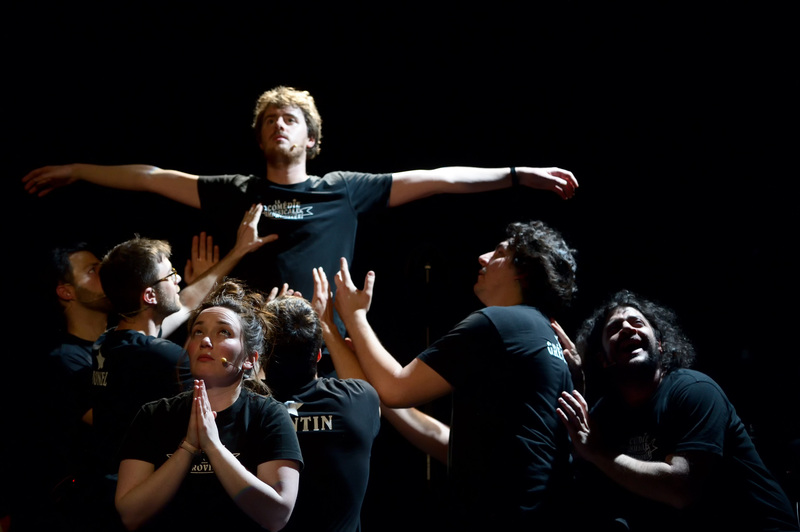 The Improvised Musical is the English version of La Comédie Musicale Improvisée: a funny and breathtaking show that celebrates the power of imagination and the versatility of musical improvisation. We love to take one suggestion from the audience to perform a seventy-minutes musical: the last text you received on your mobile, the most bizarre dream you can remember, or the feeling you’re right into. Improv is indeed the theatre of the present moment. We love to be inspired by you – will you name our next song? Among our group of fifteen performers, a whole bunch can improvise in English and would be delighted to perform for your company / festival / event / cat, in Switzerland or abroad. Please contact info@lacomediemusicaleimprovisee.ch for further information.